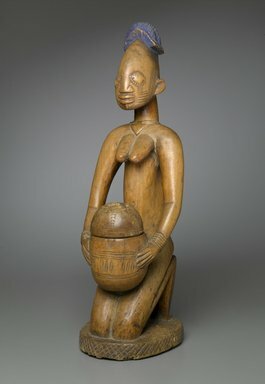 Kneeling woman figure, holding kola nut bowl, in light colored wood, with coiffure in blue pigment. Necklace with triangular shaped pendant suspended on front and back. Five bracelets on each arm, and a hip girdle. Elongated figure, with hips resting on feet, entire figure on oval base with cross hatch pattern. Sleek and well balanced. Five tiered semi-circles make up coiffure. Face has scarification patterns, eyes also emphasized with geometric patterning. CONDITION: Very good. Crack at base, check up the back and on right side of figure. Lid of calabash bowl (removable) was repaired.